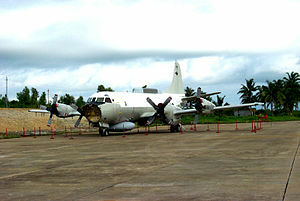 1 April 2001: The Hainan Island incident occurred when a mid-air collision between a United States Navy EP-3E ARIES II signals intelligence aircraft and a People's Liberation Army Navy (PLAN) J-8II interceptor fighter jet resulted in an international dispute between the United States of America and the People's Republic of China. The EP-3 was operating about 70 miles (110 km) away from the PRC island province of Hainan, and about 100 miles (160 km) away from the Chinese military installation in the Paracel Islands, when it was intercepted by two J-8 fighters. A collision between the EP-3 and one of the J-8s caused the death of a PRC pilot, and the EP-3 was forced to make an emergency landing on Hainan. The 24 crew members were detained and interrogated by the Chinese authorities until a statement was delivered by United States government regarding the incident. The exact phrasing of this document was intentionally ambiguous and allowed both countries to save face while defusing a potentially volatile situation between militarily strong regional states.